If you think your child has autism, or if you have a new diagnosis for your child, it's important to know you aren't alone and there are supports available for your child, and also your family. Autism is a lifelong developmental disorder, which is more prevalent in males than females, affecting approximately 1 in 100 people. 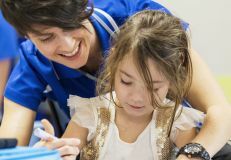 Evidence shows early intervention (delivered within a program that meets the 2012 Australian Good Practice Guidelines), makes a difference to a child's development, helping them to develop important skills that will encourage independence, the ability to communicate and opportunities for inclusion. While there's no 'cure', there is hope. Autism is part of a spectrum that is often referred to as Autism Spectrum Disorder (ASD). People with autism share challenges in two main areas, however, their condition can affect them differently. Some people are able to live relatively 'normal' everyday lives, while others may require ongoing specialist support and care. Social and communication, including difficulty with body language and verbal communication, reciprocal conversation, emotional and social reciprocity and managing structured parts of the day. Thought flexibility, including difficulty with hyper, or hypo-sensitivity to sensory input, routines, repetitive behaviours and rituals. In most Australian states and cities, you can have your child assessed by a paediatrician. To do this, you will need a referral from your general practitioner (GP). No doubt, you’ll have many questions and it can be a daunting task to research the various interventions which are available, and decide on the right approach for your family. As the National Disability Insurance Scheme (NDIS) rolls out across Australia, how you access an early intervention service provider and funding to offset the fees can differ. Call our friendly team on 1300 273 435 if you’d like advice on what your next steps should be when accessing a plan and funding for your child, or if you would simply like more information about the service offered by AEIOU Foundation. Children can be assessed and diagnosed from the age of two, although in some instances, this process can take place even earlier. 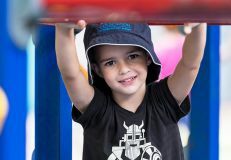 Autism Awareness Australia shares information about expected developmental milestones, and when to speak to your doctor. *Please note, the DSM 5 was released in May 2013. For information or to see frequently asked questions about the DSM 5, visit the official website.